few things can ever assuage the pain of a bleeding heart, and one of them -- at least for me -- is food. 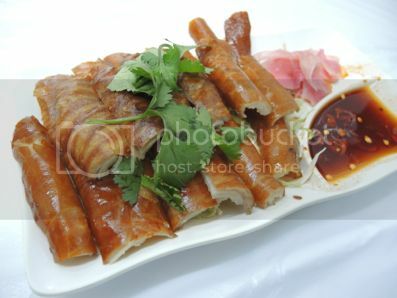 so although my knowledge of cantonese is close to nil, i decided to hit hong kong with a craving for amazing treats. i wanted, as much as possible, to shy away from expensive restaurants that reel in tourists by the busloads, and decided instead to try to find food haunts frequented by locals. 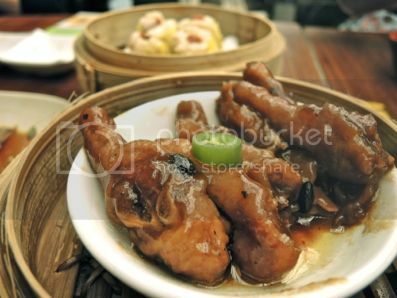 it really would have been a much easier task had i been with someone who could speak some chinese, but this did not deter me from being gastronomically adventurous. 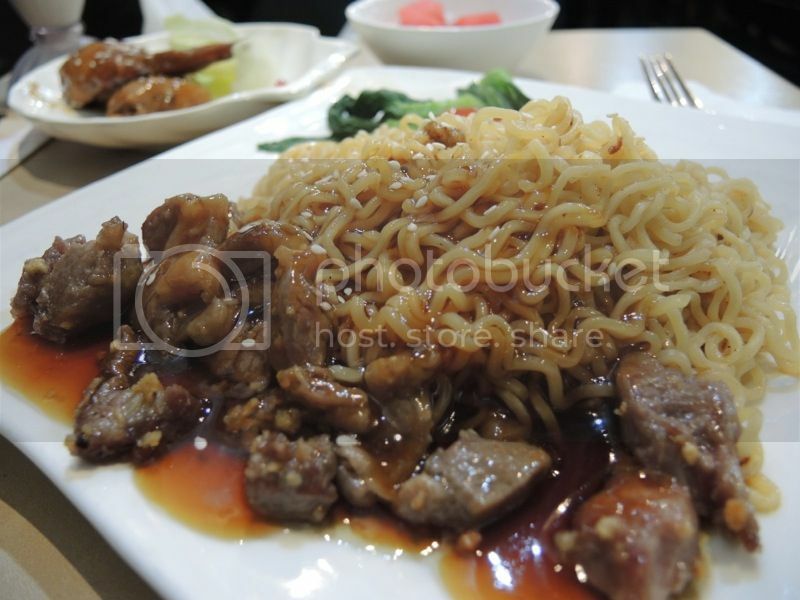 my first meal in hong kong happened in a small canteen with lovely pictures of noodles and sliced beef on its doors. i went inside and was brought to a table beside the kitchen and i was happy to find that the menu at least had english on it. 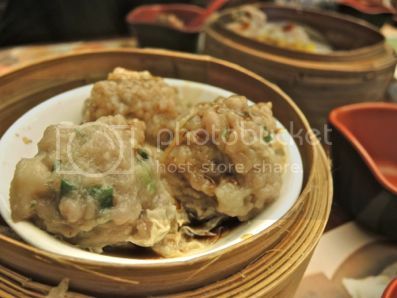 but i really was just looking at the pictures -- and for someone like me who has no idea where you could possibly get good food on a cloudy saturday in mongkok, nicely photographed food can make the difference in getting a new customer. for my other food jaunts, i found myself walking past what seemed to be a neighborhood beer joint. i was on my way to another restaurant that was highly recommended, but it apparently closes very early, so i opted for this one instead -- that it was packed at that hour meant only that it must serve very good (or very cheap) food. everyone inside had tall bottles of beer to accompany big plates of things that did not look at all familiar. 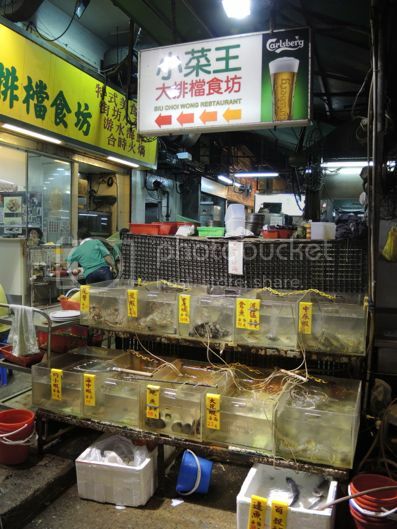 outside the restaurant were coolers filled with ice and seafood and aquariums with live fish. 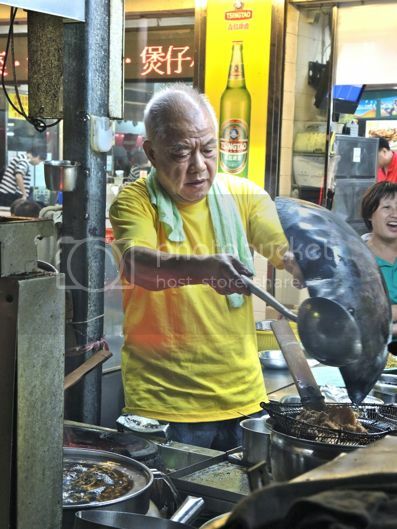 two elderly men stood over burning stoves that were stationed on a makeshift kitchen at the sidewalk, skillfully jostling giant woks. i decided to go in. 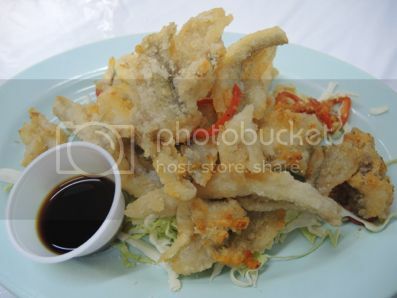 despite the language barrier and the bad translations on the menu, i could at least rely on the pictures. once again, i was given a table at the far-end of the restaurant. the party of 5 who previously used the table had just left and had successfully made a mess of things, but the waiter basically just folded the opaque white plastic sheet that covered the table and it was instantly clean. very clever, but not at all earth-friendly. i ticked off two items on the menu, each able to feed maybe two persons. i also ordered a san mig pale pilsen, which in these parts comes in slender 800mL bottles. the beer is brewed locally and corners nearly a quarter of the market, and i'm almost always surprised foreigners don't know that it as a filipino beer. they think it's from spain. while that may be historically true -- la fabrica de cerveza de san miguel was established by a prominent manila businessman of spanish decent following a royal grant from spain to brew beer in the philippines, and so named because it was opened on the feast day of st. michael the archangel -- san miguel is as filipino as the jeepney and tinikling. 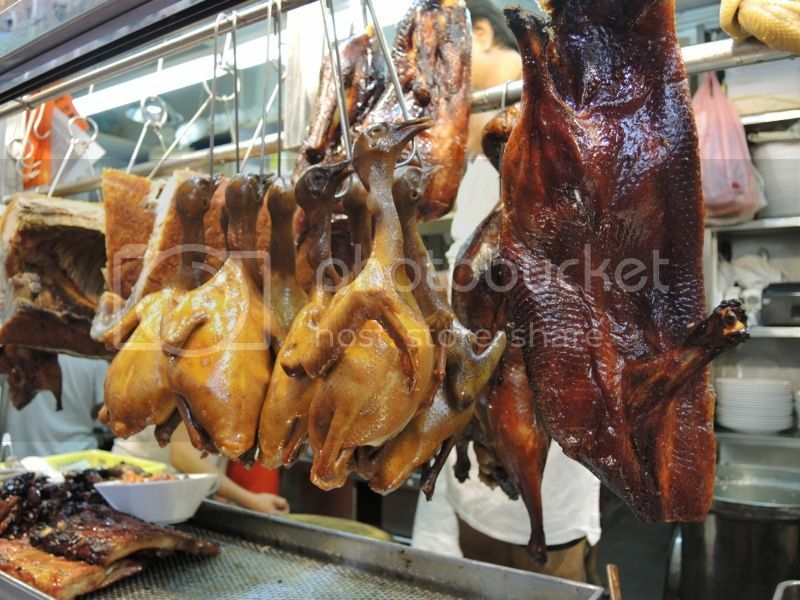 of course, when one thinks of hong kong food, images of roasted ducks and slivers of pork hanging from a display window come to mind. they're everywhere here, which makes it rather challenging to find one that's actually pretty good. i settled for one near my hostel, and as usual, i ordered more than i could eat. this was possibly the third meal i had that was good for more than two persons, it's rather amazing i didn't gain 10 pounds from this trip. the two best meals i had during this trip were starkly different but also surprisingly similar. first, the difference: price. and the similiarity: both have michelin stars. 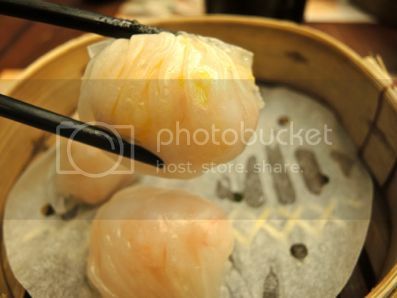 my taste buds were begging me for great dimsum, which we don't have a lot of back home. 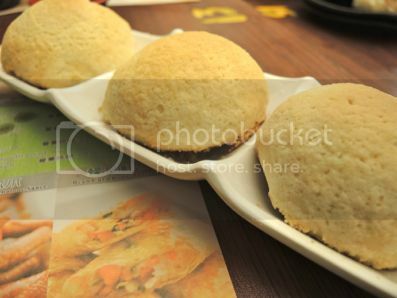 i consulted some recommendations online, and after comparing reviews, i decided on tim ho wan. specifically the one in sam shui po. 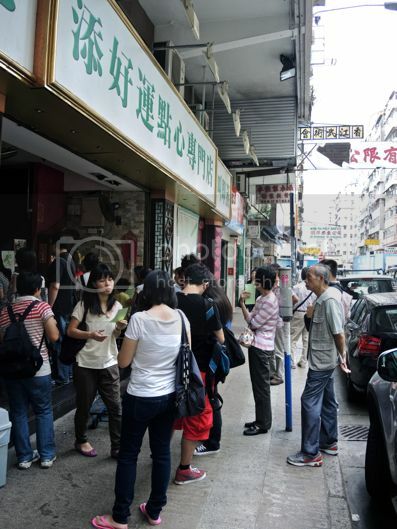 although there are 4 branches in hong kong, visitors have complained about the long wait in mongkok. i basically walked up to its branch along fuk wing street. i didn't see a sign in english: i just knew i was at the right place because there was a small crowd of people just outside. i didn't know the process, but i noticed people were getting numbers and order sheets to a lady standing behind a rostrum. "one person", i said, and she was clearly unable to communicate in a language that i can understand, but she motioned that i take a seat, but before i could warm the chair, i was directed to go inside. there was one vacant seat in a long table shared by 2 families. one of the families i shared a table with was the nicest i've encountered in a long time. they communicated to me in better than average english and recommended items on the menu. i was given a blue order slip which also provided brief descriptions of the dimsum that was available. the paper placemat also contained photographs. the family also helped me prepare my plate. i was about to sip some of the hot tea that the servers placed in front of us, but apparently, what you do is rinse your chopsticks and bowl with it first. my orders came quickly. at first i just had 3 items, but i was glancing at what the other families ordered, and the juices inside my mouth made me crave for more. before i finished my first order, i asked for another slip and ticked 3 more. 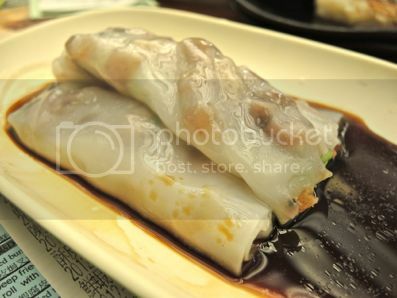 this was easily the best dimsum i have ever had in a long while, and it was not expensive, even by philippine standards. i don't know how any food establishment earns a michelin star, or how any restaurant even gets the attention of the inspectors to merit even a visit, but the opportunity to dine in one is far and few between, since we don't have any in the philippines. 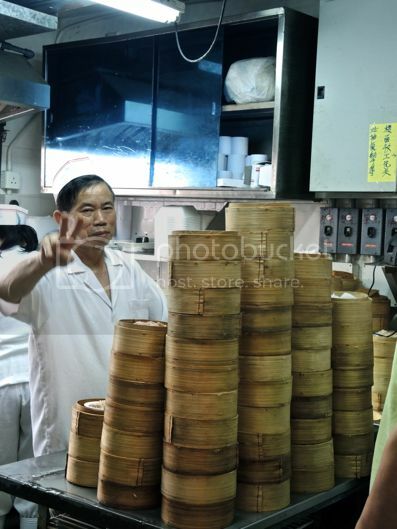 hong kong has a handful, and tim ho wan is just one of nearly 50 1-star restaurants. 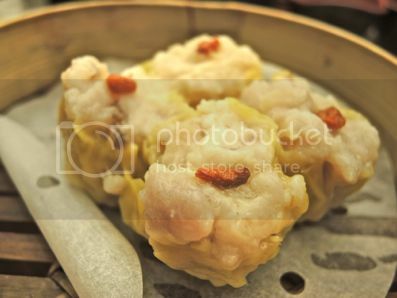 this is only the second that has been rated by michelin that i've tried, the first being din tai fung in taipei. i'm pretty sure the rating has no direct correlation with the ambiance: tim ho wan's is starkly commonplace. 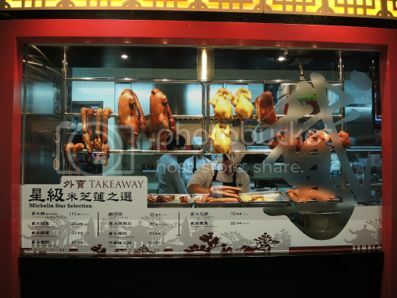 it has that busy, noisy, crowded, hong kong feel, where you aren't afforded any elbow room, and are generally nudged to hurry up because there's a long queue of diners waiting outside, even during the dead hours between lunch and dinner. 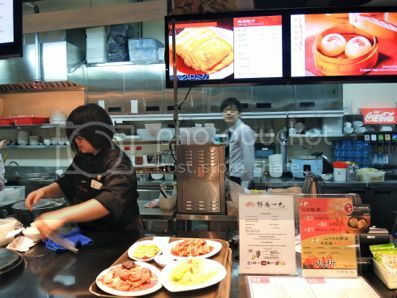 i rounded off my hunt for hong kong food with a visit to another michelin-starred establishment: hung's delicacies, which also has the distinction of being named one of the best airport restaurants in the world by CNN. i was early for my flight back home and decided to spend (make that splurge) my last hong kong dollars on my final meal. i could have just orderd a meal that i could finish, but it seemed appropriate that i sample as many dishes as possible because the likelihood of me returning soon is very low, so i thought about it as part of the experience. the waiter had to ask me again if i really was ordering the set meal for 2 persons. hung's delicacies is found in chek lap kok's terminal 2, where it has a surprisingly thin crowd when its branches outside the airport are packed. 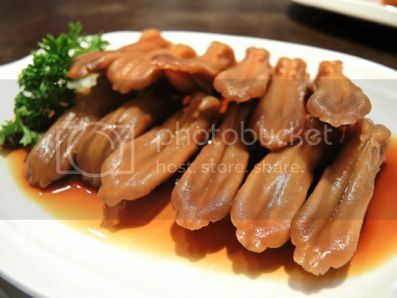 i wasn't aware of it at the time, but i ordered a dish for which hung's is famous: duck tongue. i was just curious about it and was rather surprised to find each one to be very huge, i thought they were probably performing glossectomies on really big ducks. i was also surprised that each tongue was attached to a bone. the meat was tender to the bite, although i should say ox tongue (lengua estofada, for example), crumbles and melts when cooked correctly, while this one has a rather sharp, and, uhm, different taste. i wouldn't say i was blown away by it, but i was adventurous enough to finish it all. i also finished half of the dish with sliced prok and chicken, while i barely touched the vegetables (which i brought home, and which my officemates loved!). 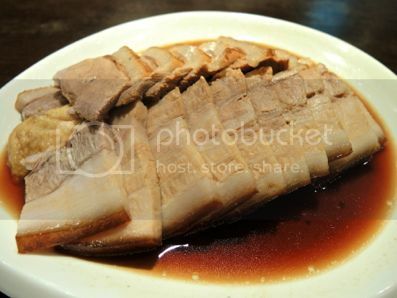 in general, it was a unique dining experience which will remind me of hong kong and how it should taste like.